I have had the privilege of coordinating our Community Catalysts Community micro-enterprise project on the ground in Birmingham for the past few months. This project is focused on developing a wide range of community micro-enterprises that can bring a varied offer of local opportunities, primarily for adults with a learning disability as well as older adults. These enterprises provide flexible support and activities that enable individuals to pursue their interests and aspirations in ways that suit them. Five months in it is becoming clear that Birmingham is an amazing city…! It was agreed that our work here would focus on 3 areas of the city – Hodge Hill, Erdington and Hall Green. The great thing about this is the hugely varied local areas that this encompasses with such a range of different ethnic mixes, cultural and local identities. As a non-Brummie southerner, it has been great fun for me to start exploring these neighbourhoods and hearing from locals. It has been so interesting to meet community members and organisations big and small doing some great work. I have found out about the underground music scene, the best curry houses, urban farms, active local churches, parks, sports groups, community cafes and hidden art clubs! Our work nurturing and promoting community micro-enterprises is embedded in the belief that local people are often best placed to meet local needs. Spending this time understanding what makes each neighbourhood great and what gives people a sense of pride is important for me; if we launch in looking for the ‘gaps’ and ‘needs’ we can overlook the greatness and the strengths that are there to build on. One fantastic example of someone getting stuck in and making things happen is Sharon. Sharon had been living in Brighton with her son for a number of years and returned to Birmingham in 2018. Sharon’s son is in his 20’s and loves music and dancing. He was really stuck into this scene in Brighton, but they couldn’t find much going on in their area of Birmingham that was able to cater for his autism. 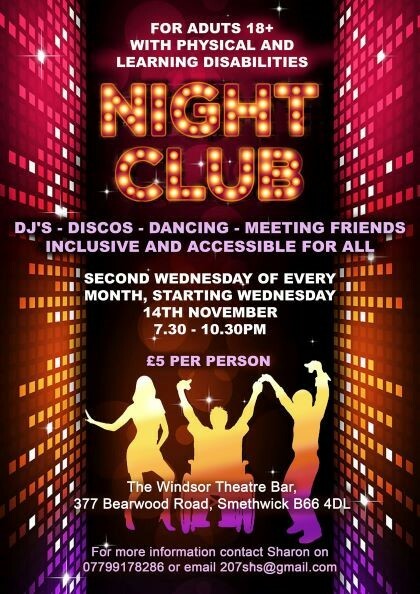 So, with the help of her friend Graham, Sharon set up Disco Inclusive and hosted their first club night in November for young adults 18 – 45 years old with learning or physical disabilities. Sharon worked hard to find a venue, even purchasing a portable ramp so that people who use a wheelchair would be able to get involved. “The vision was to create a night where our young people can come along, get dolled up and have a great time dancing to their favourite tunes. We wanted the night to be a highlight of the month! It was really important to find a ‘mainstream’ club venue, we didn’t want it to be anywhere institutional. A lot of young people with learning disabilities want to have a ‘normal’ social life – they want to be able to make friends and to explore dating, we’re creating a space where that can happen. I had a great time grooving with everyone at February’s disco night! I’m looking forward to working with Sharon and Graham, supporting Disco Inclusive to keep going and to realise their vision of growing into other areas of the city and hosting a range of different social events. Some of the practicalities involved in this vision, such as finding volunteers, sourcing funding and getting some key policies in place can be hard on your own so hopefully we can support this great night to continue.